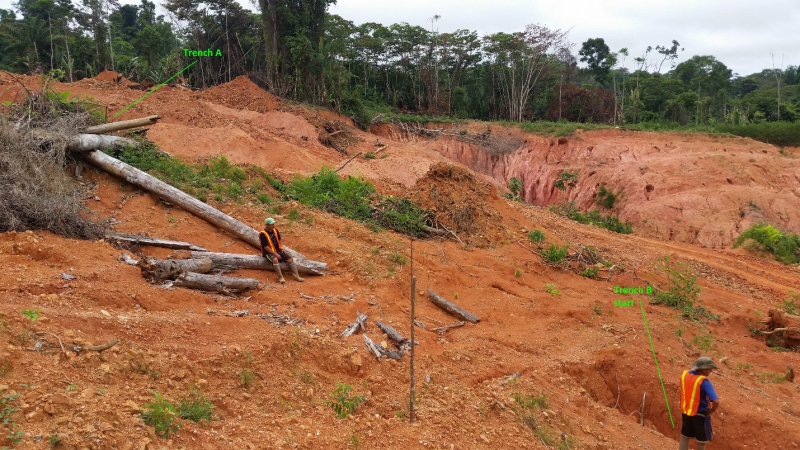 May 15, 2018 / TheNewswire / Vancouver, Canada - Guyana Goldstrike Inc. (the "Company" or "Guyana Goldstrike") (TSXV: GYA, OTC: GYNAF, FSE:1ZT) is pleased to report the new discovery of gold mineralization at the Paunch area on its Marudi Gold Project ("Marudi" or the "Property") located in the Guiana Gold Belt, Guyana, South America. Peter Berdusco, President and CEO of the Company states "These are the first assay results reported from our exploration work for 2018 on Marudi. 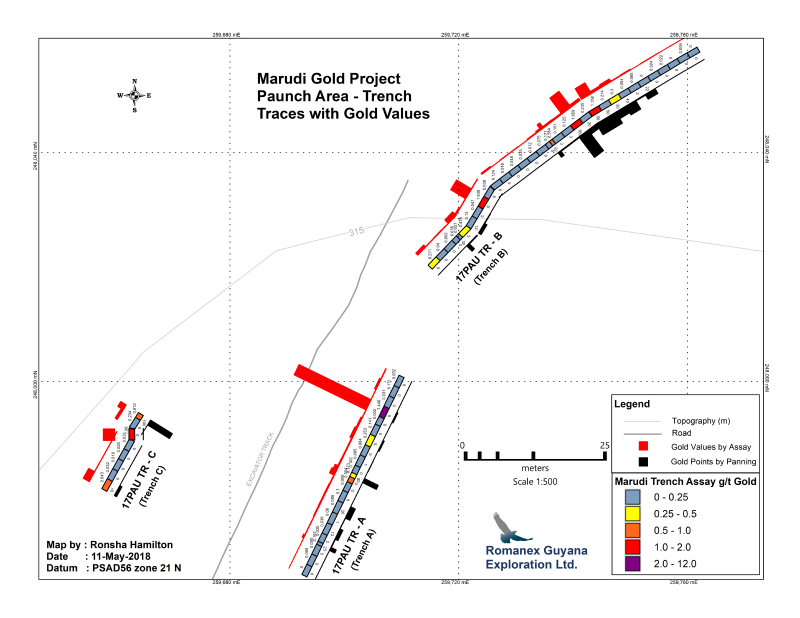 We are very pleased that the first group of trenches from our initial area of focus, Paunch, have returned significant gold values and even high-grade. Paunch is roughly 1.5 kilometres east of the mineralized Marudi North zone. As a result, this newly discovered area is now expanding Marudi's mineralized potential eastward. 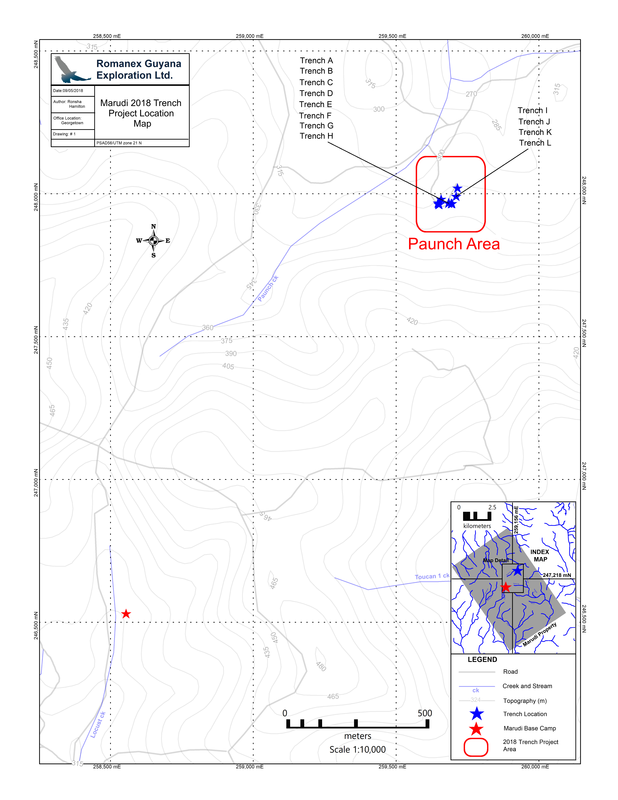 This is a great start to our trenching program and we eagerly anticipate further assay results from the nine other trenches sampled at Paunch." Below is the table of assays received by the Company, the remaining assay results from the nine other trenches will be announced when analyses have been received and maps are completed. A total of 166.4 metres of surface trenching was completed at Paunch in 12 trenches, 95 sample intervals with 166 horizontal chip channel samples analyzed (including separated undersized and oversized samples) and 5 duplicates all taken at intervals of between 1-3 metres at the bottom of the trench walls to depths of 1-3 metres.